You’ve heard it from your parents and your parents’ parents: home ownership is the American dream. But is it your dream right now? If not, you’re not alone! According to a 2017 survey by Pew Research Center, 65% of households headed by people aged 35 or younger are renting—a jump from 57% in 2006. Even among a slightly older demographic, people aged 35-44, 41% of households were renting, up from 31% in 2006. Why is renting more appealing than ever? Many of the benefits of home ownership have lessened over the years, and the housing crisis of 2008 – which left many hardworking homeowners without a roof over their heads – has had a lingering impact. Fortunately, renting is not only a good alternative…it can be a much better choice! Here are five reasons why: 1. Lower up-front costs A home purchase usually requires a hefty down payment to avoid tacking a Property Mortgage Insurance (PMI) cost onto your mortgage. Even for a modest home of $130,000, many banks prefer a $26,000 down payment if you want to qualify for the best mortgage rates. In contrast, most rental leases require a deposit of only one month’s rent…a deposit that is then returned to you when you leave your apartment or townhouse, less any cleaning/damage costs. And don’t forget, once you’re in the house, you’ll be paying interest on your loan and taxes, as well as home maintenance costs. Which leads us to… 2. No unforeseen expenses Yes, of course, renting is an expense…but it’s an expense you can predict each month. When you own your own home and something stops working – the plumbing, the heat, major appliances – you pay out of pocket for repairs. In most rental arrangements, such routine repair and maintenance is covered, except for any appliances you own. 3. Flexibility In today’s dynamic economy, life can change pretty fast. While owning a home requires some serious planning when you are considering making a job shift or moving to a new location, rental leases are far more flexible. Most leases are for six months or a year, and many include opt-out provisions if you have to move across town—or even across country—for your job. 4. Location For many young professionals, having housing that’s close to work and dynamic entertainment hubs is a huge advantage. Who wants to commute an hour a day on congested roads? However, in order to buy an affordable home, many prospective homeowners find themselves looking in the suburbs, far away from town centers. As a renter, you have your pick of apartment communities that match your lifestyle and interests—and put you close to either work or areas of the city you most enjoy. 5. Community Though as a society, we value our privacy highly, there can be such a thing as too much isolation. Being a part of a thriving apartment or townhome community can open up opportunities for you to explore new activities with like-minded neighbors, whether it’s mixing at a social event, hanging out by the pool or in the fitness center, or getting together with others for off-site adventures. Apartment living allows you to enjoy your own space when you want…and to go out and easily mix with others whenever the mood strikes. Is renting right for you? It’s easy to find out! Surf apartment communities online, make appointments to visit the ones that appeal to you, and consider everything you most want in a home –proximity to work and city areas that matter to you, size, cost, location…you deserve a home that’s perfect for your needs! And chances are, you’ll find one as a renter. 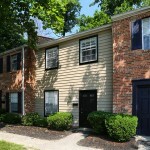 Have more questions about renting one of our apartments or townhomes? From children’s point of view : Kids find many new friends to play with in an Apartment complex like BRG @ Deercross. Parents don’t need to organize kids playdates and save time of drop off and pick up. This is the main reason we are not buying a house.